NEW HAVEN, Conn. – The Yale women’s ice hockey team is getting a big assist in its efforts to honor the memory of Mandi Schwartz ’10 (1988-2011) at the annual “White Out for Mandi” game at Ingalls Rink on Friday, Jan. 24. When the NHL’s St. Louis Blues found out about the event through Mandi’s brother Jaden Schwartz — a forward who is in his third season with the Blues — they decided to show their support by having the entire team attend the game with Jaden that night (7:00 p.m. vs. Brown). The goal is to pack Ingalls Rink, with everyone wearing white, as a “White Out for Mandi”. The event is a fundraiser for the Mandi Schwartz Foundation. To accommodate the trip to the Yale women’s ice hockey game on Jan. 24, the Blues have moved their practice that afternoon to Ingalls Rink. The practice starts at 3:00 p.m. and will be open to the general public. 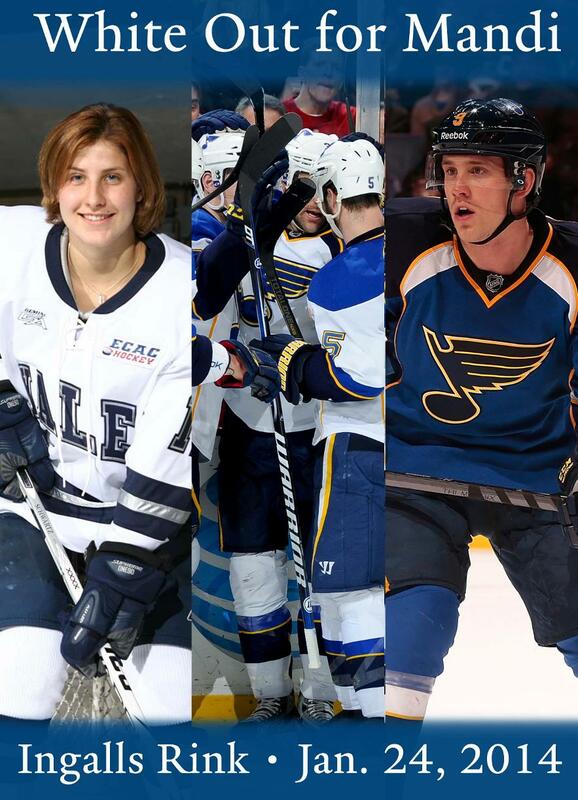 St. Louis selected Jaden in the first round of the 2010 draft, when Mandi was still battling cancer. The Blues have been a key source of support for the Schwartz family ever since, and even had then-president John Davidson attend Mandi’s memorial service at Athol Murray College of Notre Dame in her home town of Wilcox, Saskatchewan, in April of 2011. The Schwartzes have maintained their connection to the Yale women’s ice hockey program, and the Yale team has kept Mandi’s jersey and locker intact in the locker room at Ingalls Rink. Another one of Mandi’s game-worn jerseys was recently given by the Schwartzes to the Upper Deck sports card company, which has created special Mandi Schwartz hockey cards containing a piece of the jersey for its “Heroic Inspirations” series. Those cards will be available for purchase at the “White Out for Mandi”. The Blues — the team that Keith Allain ’80, Yale’s Malcolm G. Chace Head Coach of Men’s Ice Hockey worked for as goaltending coach from 1998 to 2006 — will be in the New Haven area because they play at the New York Rangers on Thursday Jan. 23 and at the New York Islanders on Saturday Jan. 25. In addition to Jaden, the Blues’ roster includes U.S. Olympians David Backes, T. J. Oshie and Kevin Shattenkirk; Canadian Olympians Jay Bouwmeesterand Alex Pietrangelo; Czech Republic Olympian Vladimir Sobotka; Russian Olympian Vladimir Tarasenko; Slovakian Olympian Jaroslav Halak; and Swedish Olympians Patrik Berglund and Alexander Steen. This is the second season in a row that there has been an NHL presence at the “White Out for Mandi”. Last year, Montreal Canadiens defenseman P.K. Subbanattended the game just prior to signing a new contract with Montreal. Aleca Hughes ’12, Yale’s former captain, started the Mandi Schwartz Foundation in memory of Mandi, the Bulldogs center who passed away in April 2011 after battling cancer for more than two years. Donations to the Mandi Schwartz Foundation will be accepted at the door on Jan. 24. Special white sweatshirts are being sold, and youth hockey teams are encouraged to come wearing white jerseys. Additional details about the day, including auction items, will be announced in the near future. In addition to raising funds for the Mandi Schwartz Foundation, the event will also help raise awareness of the need for marrow donors and umbilical cord blood donors. In an effort to save her life in the fall of 2010, Mandi had a stem cell transplant utilizing blood from two anonymous umbilical cord blood donations. Stem cells for patients with life-threatening illnesses like Mandi’s can also come from marrow donors. Yale hosts an annual Mandi Schwartz Marrow Donor Registration Drive every spring to add potential donors to the Be The Match® Registry. To date, at least 21 donor matches for patients in need of transplants have been identified through those efforts. One of those donor matches was a Yale football player, senior John Oppenheimer. The attendance record for a women’s hockey game at Ingalls Rink is 1,539, set on Nov. 1, 2005, when Team USA played an exhibition game against the ECAC Hockey All-Stars. The capacity of Ingalls Rink is 3,500. NEW HAVEN, Conn. – The Yale women’s ice hockey team is dedicating its game at Ingalls Rink on Friday, Jan. 24, to Mandi Schwartz ’10 (1988-2011), utilizing the game vs. Brown at 7:00 p.m. that night as a fundraiser for the Mandi Schwartz Foundation. The goal is to pack Ingalls Rink, with everyone wearing white, as a “White Out for Mandi” show of support. Donations to the Foundation will be accepted at the door. Special white t-shirts will be sold, and youth hockey teams are encouraged to come wearing white jerseys. Additional details about the day, including auction items and special guests, will be announced in the near future. Aleca Hughes ’12, Yale’s former captain, started the Mandi Schwartz Foundation in memory of Mandi, the Bulldogs center who passed away in April 2011 after battling cancer for more than two years. In addition to raising funds for the Mandi Schwartz Foundation, the event will also help raise awareness of the need for marrow donors and umbilical cord blood donors. In an effort to save her life, Mandi had a stem cell transplant utilizing blood from two anonymous umbilical cord blood donations. Stem cells for patients with life-threatening illnesses like Mandi’s can also come from marrow donors. Yale hosts an annual Mandi Schwartz Marrow Donor Registration Drive every spring to add potential donors to the Be The Match® Registry. To date, at least 20 matches for patients in need of transplants have been identified through those efforts. One of those genetic matches was a Yale football player, senior John Oppenheimer. 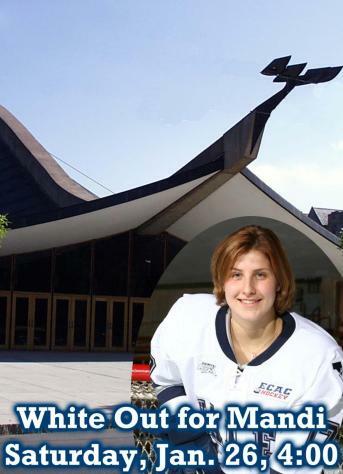 The attendance record for a women’s hockey game at Ingalls Rink is 1,539, set on Nov. 1, 2005, when Team USA played an exhibition game against the ECAC Hockey All-Stars. The first “White Out for Mandi” drew a crowd of 1,066, the largest crowd in history for a Yale women’s hockey game. The capacity of Ingalls Rink is 3,500. NEW HAVEN, Conn. – The Yale women’s ice hockey team is dedicating its game at Ingalls Rink on Saturday, Jan. 26, to Mandi Schwartz ’10 (1988-2011), utilizing the game vs. Colgate as a fundraiser for the Mandi Schwartz Foundation. Aleca Hughes ’12, Yale’s former captain, started the charity in memory of Mandi, the Bulldogs center who passed away in April 2011 after battling cancer for more than two years. The goal is to pack Ingalls Rink, with everyone wearing white, as a “White Out for Mandi” show of support. The team is currently lining up pledges from donors based on the attendance total, so each person that shows up helps raise money for the cause. No admission will be charged, and donations for the Foundation will also be accepted at the door. Special white t-shirts will be sold, and youth hockey teams are encouraged to come wearing white jerseys. The Bulldogs will honor Mandi in a special pre-game ceremony. The event will also help raise awareness of the need for marrow donors and umbilical cord blood donors. In an effort to save her life, Mandi had a stem cell transplant utilizing blood from two anonymous umbilical cord blood donations. Stem cells for patients with life-threatening illnesses like Mandi’s can also come from marrow donors. Yale hosts an annual Mandi Schwartz Marrow Donor Registration Drive every spring to add potential donors to the Be The Match® Registry. To date, at least 14 matches for patients in need of transplants have been identified through those efforts. One of those matches was a Yale field hockey player, senior Lexy Adams. The attendance record for a women’s hockey game at Ingalls Rink is 1,539, set on Nov. 1, 2005, when Team USA played an exhibition game against the ECAC Hockey All-Stars. The first “White Out for Mandi” drew a crowd of 1,066, the most ever for a Yale women’s hockey game. The capacity of Ingalls Rink is 3,500. The weekend of Jan. 25-26 is also Alumnae Weekend at Ingalls Rink. NEW HAVEN, Conn. – The “White Out for Mandi” Yale women’s ice hockey game at Ingalls Rink on Saturday, Jan. 26, will include a special presentation. Carol and Rick Schwartz, parents of Mandi Schwartz ’10 (1988-2011), will travel to the game from their home in Wilcox, Sask., to present ECAC Hockey’s Mandi Schwartz Award, given annually to the conference’s student-athlete of the year. The award winner, announced at the conclusion of last season, is Yale’s Aleca Hughes ’12. The “White Out for Mandi” game vs. Colgate at 4:00 p.m. is a fundraiser for the Mandi Schwartz Foundation. Hughes, Yale’s former captain, started the charity in memory of Mandi, the Bulldogs center who passed away in April 2011 after battling cancer for more than two years. The goal is to pack Ingalls Rink, with everyone wearing white, as a “White Out for Mandi” show of support.